Did you ever do anything COMPLETELY Different than you planned? Did you ever do anything COMPLETELY Different than planned? Did you ever do anything COMPLETELY Different than you planned? I did! When I saw this sketch challenge from Global Design Project, I immediately envisioned using the Beautiful Peacock stamp in the focal point, and using the beautiful bright blues & greens & golds of a real peacock. What I ended up with isn’t even remotely close! No peacock in sight! Does that ever happen to you? I just didn’t like the way the peacock had to be cropped to fit in the circle, so I just scrapped that idea entirely and went in a different direction, and boy I’m sure glad I did! I really like the way this card turned out. (Confession: I ultimately wound up using a larger punch than I was planning and the peacock may have fit much better in the larger 2-1/2″ circle. But don’t tell the Peacock!). Anyway, this card gave me opportunity to break out my sponge brayers that have been sitting idle and feeling lonely lately. I just love to color, whether with colored pencils, crayons, Stampin’ Blends, and coloring the background with a brayer is just joyful to me. 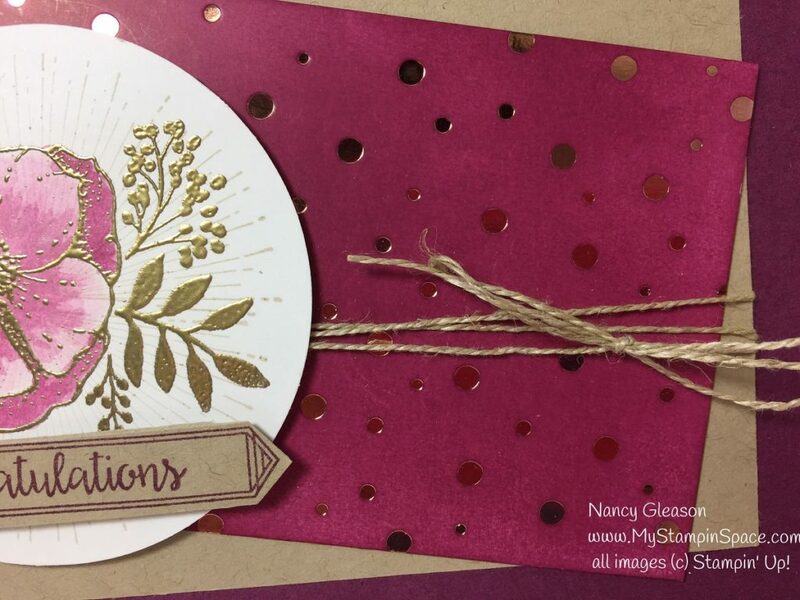 A sponge brayer, an ink pad and the Springtime Foils Specialty DSP created the layer immediately behind the focal point. The metallic dots resist the ink so when you color the paper, the metallic print isn’t affected! I like the way the Rose Gold metallic looks against Rich Razzleberry. 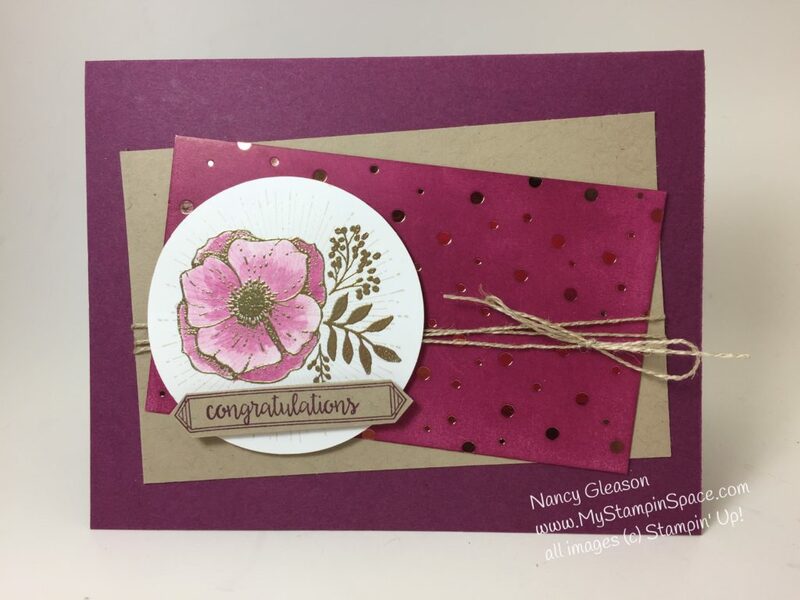 A piece of Crumb Cake cardstock behind this gives balance and contrast to this busy layer, and the Rich Razzleberry card base ties it all together. Next up I colored the flower using Rich Razzleberry ink and my aqua painter. I layered the ink on very lightly and built it up a layer at a time. 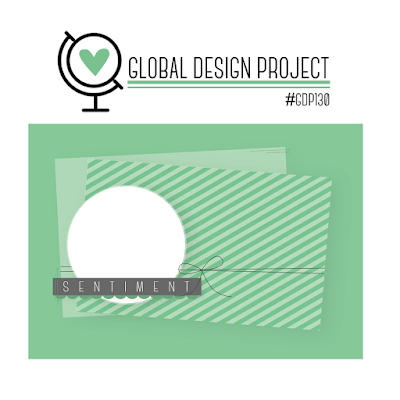 Another scrap of Crumb Cake cardstock provided me with just the right thing for my sentiment layer. 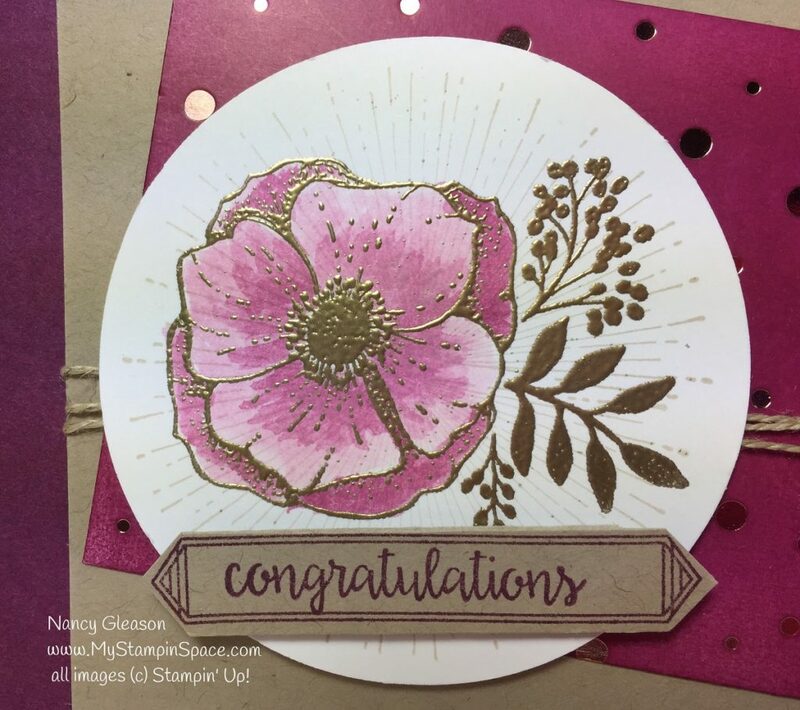 I stamped the border & Congratulations from “Happy Birthday Gorgeous” in Rich Razzleberry ink and enlisted the help of my snips to crop out that shape. ← Bubble Over with Happiness During the last few days of Sale-A-Bration!